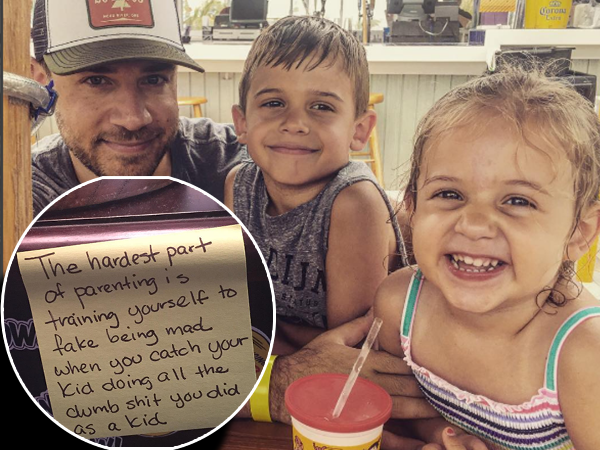 A stay-at-home dad of two found a hilarious way of letting his wife know what happened while she was at work. Chris Illuminati leaves handwritten sticky notes around the house which detail the funny, yet rather tough reality of caring for two children. He began posting photos of the notes on his Instagram, Message with a bottle and is now getting tons of attention on social media. The 39-year-old quit his job in 2010 to be a stay-at-home father after the birth of his first child. Chris told The Metro that his decision to stay at home with his little one came after he realised how expensive daycare was. "Daycare is obscenely expensive. It made more sense to watch my kid instead of working to pay someone else to do it. So I quit my job to watch him and freelanced on the side." Chris has a son a seven-year-old son, Evan, and four-year-old daughter, Lila, with his wife of nine years Libby. Although she trusted him with the kids, she would leave Post-it notes around the house to remind him of his tasks. Soon he got into the habit of leaving Libby notes around the house to make her laugh. After seeing how much his wife enjoyed them, he posted some to Tumblr, where people responded similarly – so he to started his own website, A Message With A Bottle. "When I first started this I was an obsessive Twitter user (still am) so my mind was always thinking in these terms of 'short joke to make someone laugh' and it kind of transferred over to written notes," he told Metro. "The purpose is to make other parents (or even non-parents) laugh. Because raising a kid is sort of the same for everyone. We all have these moments with our kids." Seven years into it Chris says he wants to turn this into a lifestyle and just keep parents laughing about parenting. "My ultimate goal is establishing a community of parents to just laugh about the awesome absurdity that is raising kids." Sources: Metro Uk. 13 News Now. Viral Thread.